Packed with the latest features, the sleek and stylish Dell Studio 17's serious power and breathtaking graphics set a new standard for premium performance. 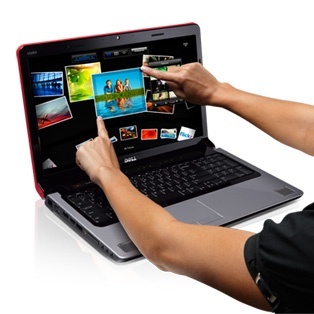 Take your music, movies and games with you on a laptop that offers superior sound and cinematic-picture quality. Boost your productivity with the state-of-the-art Intel ® Pentium ® processors. You shouldn't have to compromise when it comes to watching your favorite movies. The Dell Studio 17 delivers the cinematic quality your movies deserve and exceptional acoustics you have come to expect from JBL. Turn it up with JBL ® + SRS Premium Sound TM audio, backed by a sizable subwoofer that amplifies your music listening. Experience the action up close with an ATI Mobility Radeon TM HD 4650 graphics card up to 1GB. The 1GB dedicated graphics memory option frees up space, improving both system and graphics performance. Immerse yourself in your entertainment with a 17.3" 16:9 HD+ (1600 x 900) display. The optional Full HD (1920 x 1080) B+RG LED display's 92% color gamut creates a LCD TV-like feel for watching movies and shows. Watch your movies in Hi-def with the optional Blu-ray Disc TM drive. Quickly locate your touch applications and access all your media content in a touch-friendly way. Have fun with your photos. Pinch, zoom, and rotate photos with the touch of a finger. Once you're finished, simply flick to post them online to share with family and friends. Listen and create music playlists, leave notes for family members or browse the web using multi-touch. Personalize your laptop with a design that shows off your creativity – with over 200+ design options to choose from. Or select one of six vibrant colors that complement the Dell Studio 17's sleek look: Black Chainlink, Midnight Blue, Ruby Red, Spring Green, Plum Purple and Promise Pink. Indulge yourself with features that make the Dell Studio 17 stand out from the rest. Increase your system's performance and response time with up to 8GB DDR3 1333MHz dual-channel memory. Load your photos, music and movies on the 500GB hard drive or give yourself more space with up to 1TB of storage using dual hard drives. Stay in touch with your friends and family with the built-in 2MP HD webcam and dual- array microphone. Keep your phone charged while on the go with the USB 2.0/eSATA combo port and PowerShare feature.